Our Fast and Professional Technicians Are Just a Phone Call Away! Our team handles repairs for every single component of your garage door. With more than a decade of experience behind us, our team understands exactly what kind of issues the different parts of your door can develop, and how to fix them. Simple defects like this can ruin the curb appeal of your property, and even pose a potential security threat. Small dents in aluminum and steel doors can often be removed, but severe damage usually requires a replacement panel. Thanks to our strong relationship with industry leaders like Clopay, Windsor and Amarr, our team can quickly supply a new panel for your door, restoring it to perfect condition. The drive system of your door opener has to haul a 150lb+ door up and down every day, and this stress can lead to the gear burning out. If this happens, we’ll find and fit a replacement for you. Again, over our many years in the industry we’ve developed close ties with some of the best manufacturers around; Craftsman, Linear and Genie to name just a few. Our team is ready to help at a moment’s notice; if you urgently need our help, we’ll be there. We’re also on hand to provide expert maintenance and repairs for any component, from the springs, to the rollers and your remote system. 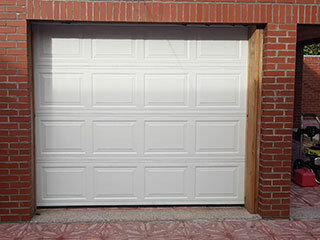 Contact Garage Door Repair Forney today to schedule an appointment with our team.